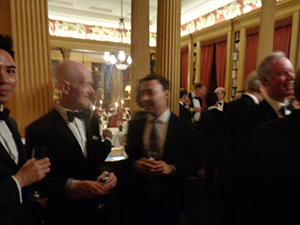 Black tie events and visits to London’s traditional gentlemen’s clubs are both very popular activities for our members, and a combination of the two is especially appreciated. The Travellers Club was founded in 1819 and has been in its present Pall Mall location since 1832, situated between the Athenaeum and Reform Clubs, with which it shares a large garden. The club has a very good reputation for its catering and did us proud on this convivial occasion, illustrated (left). 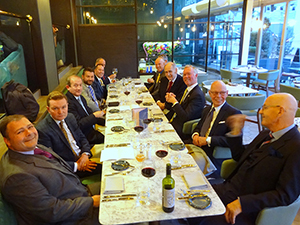 We were off to a bright start to our September Social with an excellent and well-attended dinner (left) in the 'Lampery' restaurant of the Apex City of London Hotel in Seething Lane. We moved later to the comfortable adjoining bar lounge, and chatted happily there for the rest of the evening, reflecting once again that City of London hotels often provide better value than their West End equivalents. Seething? We were very far from disgruntlement! The large party which flew from London to Bucharest on September 14th for a five–day visit to Romania was in for a treat! Meticulously planned by Shonn, a young and active member of SATS, who was originally from that country (pictured left), our whirlwind tour took in a vast palace, two famous castles, a house owned by Prince Charles, a ride by horse and cart, and many other sights, accompanied by numerous meals, formal and informal. 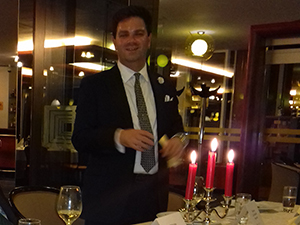 We were off to a good start as Shonn had chosen a superb hotel, the Marriott Grand in Bucharest, and we dined al fresco in a beautiful wooded garden restaurant that evening. Romania - Magnificent legacy of a crazed dictator! 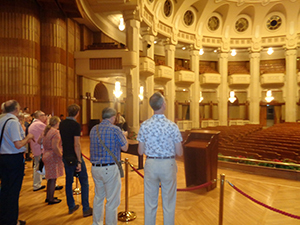 The next day we visited the massive Romanian Parliament Building in Bucharest, apparently the second largest building in the world, only exceeded by the USA Pentagon. This was conceived by the late unlamented Communist Dictator, Nicholas Ceaucescu, and if we wanted to know what a megalomaniac can achieve, this was it. The vast hilltop bulk is not unattractive in appearance but consists of an apparently endless series of oversized halls and rooms, all designed to exalt the stature of the Great Leader – until 1989 when he was summarily executed! Our group gazes in awe at the world's largest chandelier. 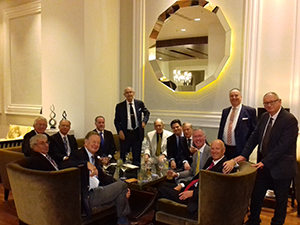 Our first formal, suited, dinner was held in the Steakhouse Restaurant at the Marriott Hotel and the pictures shows most of the group assembling in the spacious bar before going up for the excellent meal. As some pictures indicate, casual dress is customary on our away trips, but suit and tie is de rigeur for the formal dinner. In this instance we had two such events, in both Bucharest and in Brasov, the pleasant old walled town where Shonn’s family reside.